Coming to today's poppyseeds dinner rolls, usually i'll stick with black poppy seeds when its comes to baking, but this time instead of going for black poppy seeds i baked my dinner rolls with white poppy seeds. These dinner rolls goes to this month's Home Baker's Challenge, a monthly baking event where we bake varieties of baked goodies, the host of this month is Gayathri of Gayathri's Cook Spot, she suggested different bread rolls for this month's challenge.From the couple of bread rolls she gave,i picked this beautiful, buttery poppyseeds dinner rolls which is completely egg free. 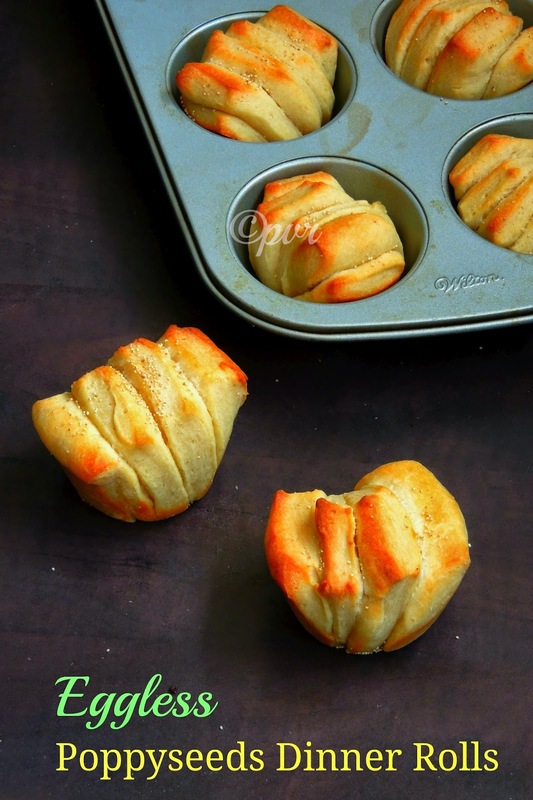 Butter used in this rolls plays an important role and trust me this rolls are dangerously addictive, you doesnt even need any spread to enjoy with. Just dip a piece of this bread in a hot masala chai, have it. Am sure you will definitely enjoy thoroughly this rolls for your evening snacks. 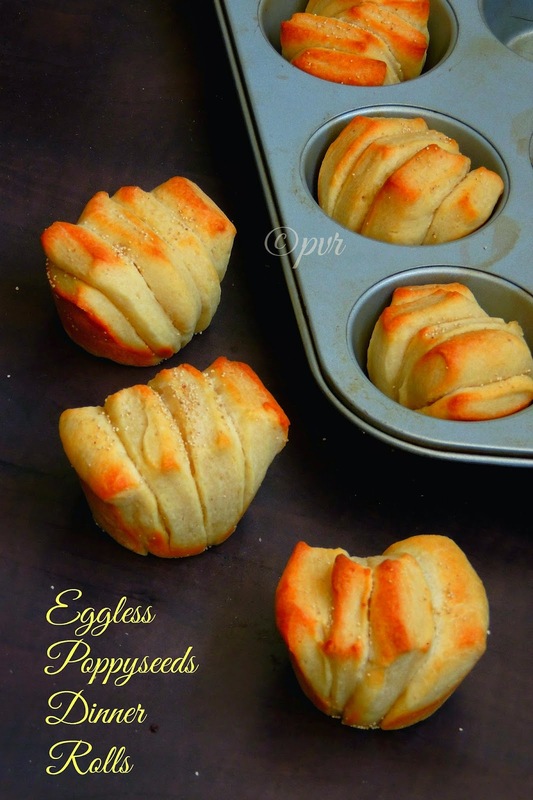 Thanks Gayathri for pulling me to bake these eggless dinner rolls, we just loved it. Take the water, milk,sugar, salt,poppyseeds in a large bowl, add in 1cup of flour and yeast, mix well until it turns smooth. Roll the dough to a large thin square, divide into 12 equal portions, cut them as small rectangles. Stack 4-5rectangles together and place it in a muffing mould, continue the same process with the remaining portions. Preheat the oven to 350F, bruch the rolls with melted butter, sprinkle poppyseeds on the top. these dinner rolls look so perfect and yum! These dinner rolls look awesome! looks so perfect. your recipe / pics can convince anyone that baking is so simple :-) .. Pass me this roll for my dinner today? You are a pro, I don't think you need to be 'trying' any baking goods, they all so perfectly made.